The following are modifications of firefox with a mix of bookmarklets, Greasemonkey scripts (coming soon), and extensions that I have made or modified. I did them because I wanted functionality. Make Firefox allow old versions of an extension. This has probably happened to you before. You try and install and extension but firefox says that it is to old and not compatible. Most of the time they are it is just that the author hasn't updated the install files to reflect the new browser version. So lets do it for them. Save an extension to your computer where you have access to edit the files. Right click on the "install now" link and say save as. Note that in this example at the top it says that 1.0.4 is the max. All well and good if you are using firefox. But what about us Nightly Build users. Well like all beta people we will forge ahead AND THE BROKEN EXTENSIONS BE DA ... ahem ... moving on. Now that you have saved the file to a folder you will need to get inside. Wait a minute, you think, its a xpi format. How do we do that? Easy. Change the extension. Now the trouble lies in the fact that Windows XP hides the extensions by default. We will need to change this. You are probably thinking "why" because you can see the .xpi extension but once you change it you will not be able. Open up "My Documents" click "Tools" click "Folder Options" go to the "View" tab. Uncheck the "hide known extension types" box. Now that thats done we can begin to hack away. First rename the extension from .xpi to .zip. Thats right. XPI files are no more than zip files (sorta, they have certian switches and the such but who care it works this way for what we are doing). So lets get in there. Extract out just the install.rdf file and lets fix that hang up. change this to <em:maxVersion> 2.0+ </em:maxVersion> or equal to the version number of the firefox you intend to use then theand save the file somewhere near the Zip file. Now copy into the zip file the edited install.rdf replacing the one there. Rename the .zip to .xpi and you are ready to install. In firefox do a File > Open browse to the edited XPI file. The install file should come up and install the extension. If the browser crashes then use the safemode and uninstall the extension. Have fun taking back your extensions. NOTE: This is now outdated and is no longer viable. The author has discontiunued the project. He is recommending that users switch to the GreaseMonkey script pkLaunch. This is the story of what I did just for sake of being here. 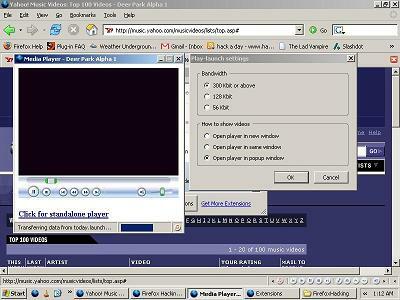 Around June of 2005 I got to looking at the Play-Launch extension and found that on windows it did not work quite right. The process was quite complex to get it working. I simply took and started playing around. I found the popup was just a link to the movie. I went and added code to place an Embed tag and then windows and linux could take advantage of the yahoo videos. Contacted the author and he got the extension changed. Now with an embeded player!